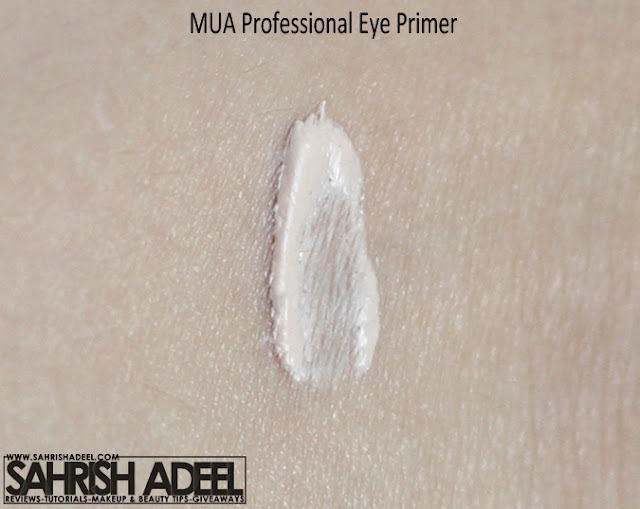 Professional Eye Primer by MUA (Makeup Academy) - Review, Swatch & a Look! | Sahrish Adeel - Malaysia based Pakistani Beauty & Lifestyle Blogger! Professional Eye Primer by MUA (Makeup Academy) - Review, Swatch & a Look! Having oily lids can be a problem in a number of ways. If you don't have a solution, you end up with creased and toned down eye shadow in less than one hour. And if you don't have oily lids but your eye shadows do not look as intense as you see them in your eye shadow palette, you need something that will work for you. In this post I will tell you how you can have perfect looking eye shadows throughout the day by going easy on your pocket. 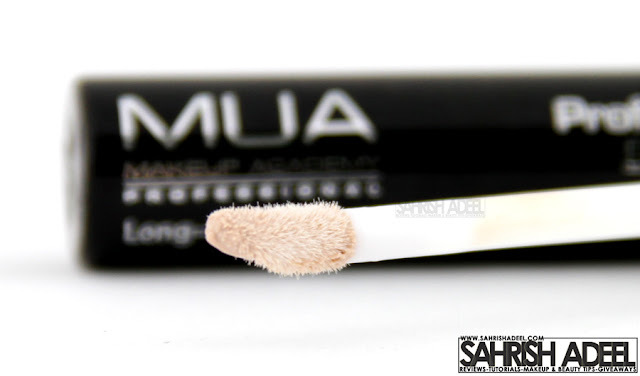 Professional Eye Primer by MUA comes in a plastic tube with a brush applicator. The tube comes in a card box. It contains 7.8ml of product. I ordered it with a few other products and everything reached nicely packed. Just dab tiny dots on your eye lids and blend with finger or brush. I have really oily lids and eye makeup for me never stayed for more than one hour if not applied over an eye primer. It will crease, tone down and by the end of the day, you won't even see if I had eye makeup done. I heard about eye primers and really wanted to try one but the ones I came to know about were way too heavy on my pocket. I decided to order some cosmetics from MUA's website one day and ordered this eye primer as well. I used it for the first time and I was like 'Why did I order just one piece of it?'. It gave me some unexpected results for the price I paid. My eye makeup does not crease and tone down much throughout the day even if I sweat too much. All the colors I apply now look really enhanced. I know people use eye shadow base to enhance the colors but those do not work for me because of my oily lids. They enhance the color but the eye makeup creases up in less than one hour. This eye primer is like a dream come true for me and is now a part of my makeup routine. I can say that I apply it every time I apply my makeup. Moreover, if I apply it under my eyes, it keeps my concealer from creasing. It did not irritate my eyes at all. If I am just wearing a pencil eye liner on my eye lids, I apply that over this eye primer and it keeps my eye liner in place for really long hours. Eye makeup without eye primer = gone. Eye makeup with this eye primer = still there and you cannot say if I took a shower. I am not exaggerating anything here. I tried it again and got the same results. I was unable to use cream shadows or eye shadow base before as they crease really quickly on oily lids. This eye primer also helped me with that. So if I am using really bright colors and I feel like I might need an extra base of may be NYX's Jumbo Eye Pencil in Milk, I apply that over it and voila, extra bright eye shadow that won't crease or tone down soon. Overall, I am in love with this product and I am going to buy it over and over again for sure. If you are looking for a really good quality eye primer which is absolutely light on your pocket, go for this one. I am 100% sure that you will also love it like I do. Great great great product by MUA. You can get it for £2.50 from MUA's website here. They ship worldwide and their shipping charges are really affordable. If you are living in Pakistan, you can get it for PKR 450 from Just4Girls.pk here. People who are living in Pakistan should feel really lucky that you have this amazing website that provides you with amazing products at your door step at extra ordinary reasonable prices. I always had problem creating smokey eye makeup as I can not use creamy base or black pencils on my eye lids because they crease. I tried this eye primer and look what I created. I used 24 Shade Immaculate Collection Palette by MUA (review here). I did this look in the morning, then I did the laundry, washed dished, cooked lunch and cleaned the house. It was there on my eyes even at the dinner time. Let's say that would be 10 hours approximately. Have you tried this eye primer yet or are you going to buy it? Purple Makeup Look with product details!